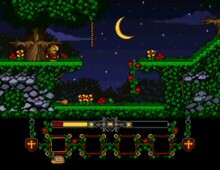 Sir Fred is an excellent SVGA remake of one of the best Spanish games ever made for the 8-bit MSX platform. This version for Windows-based PCs features great graphics and the same addictive gameplay as the original arcade-adventure. From the website: "In classic arcade-adventure style, Sir Fred has to collect object and solve problems as he penetrates the defences of Castle Feare, the Baron's stronghold. The objects are found in different locations each time you play, which complicates mapping somewhat, but must be used to complete the various tasks. There are a number of weapons to be found including a sword and a bow and arrow. Sir Fred himself has only a limited amount of energy (and only one life) so you'll need to use the weapons to defend him from the various creatures inhabiting the castle." Perhaps best of all, this modern remake has translated the Spanish text into English. Highly recommended for everyone who likes the Dizzy games, or the 2D arcade-adventure genre in general.